Resin pots are rich in artistic form, carving fine, high simulation similarity. Hanging garden pots give you an ideal home, the pursuit of this attitude towards life. Hanging garden potted fairy-tale world of beautiful round into the display of life. Add more color and fun to your home. More of the animation world into our lives, planted on their favorite green plants, with some decorative of the cartoon, DIY their own pastoral world. Rich in detail, texture clear. Has a rich artistic modeling, carving fine, simulation similarity is extremely high. 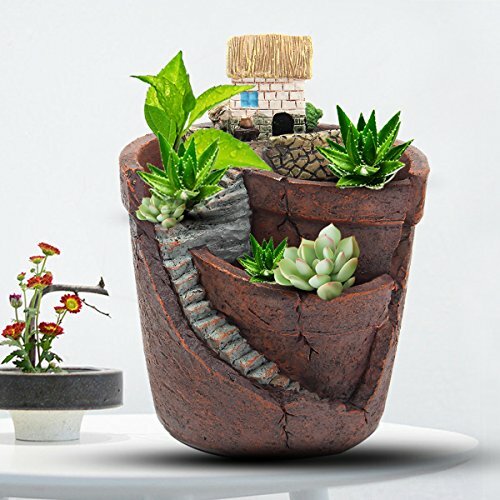 Imitation ceramic handicrafts flower pots, light weight, better water absorption. Bottom have a drainage holes, four anti-skid pad. If you have any questions about this product by KINGSO, contact us by completing and submitting the form below. If you are looking for a specif part number, please include it with your message.